During the nine days of Navratri there is a custom of wearing 9 different colour dress – Sarees (Saree) and Churidar – mainly in Gujarat and Maharashtra. Information on what are the Navratri colours 2019 (September - October) usually appears a couple of days before in local Gujarati and Marathi newspapers. This is the latest information regarding the nine colors of Navratri in 2019 with date. The colors are not followed during Chaitra Navratri (March - April). The nine colors symbolically represent the nine forms of Goddess Durga that are worshipped during Navratri. Traditionally the colors change from year to year. In some regions the form of the Goddess worshipped and name varies from region to region on nine days. Women, girls and children wear the particular color of dress (like Saris (Saree), churidar) on each day of Navratri. Amba, Tara, Shorashi, Bhuvneshwari, Chinnamasta, Bhairavi, Dhoomavati, Bagala, and Matangi are forms of Durga worshipped in Gujarat during the nine days of Navratri. 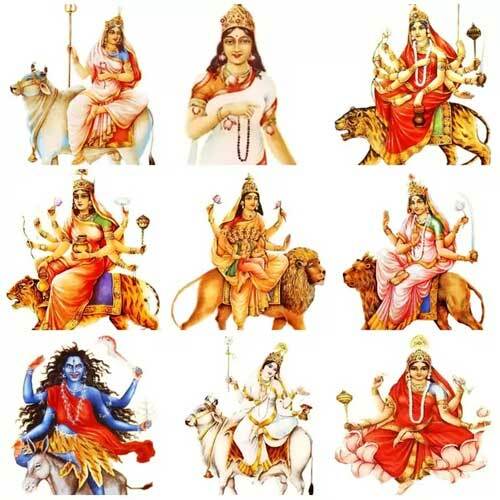 Amba, Chamunda, Ashtamukhi, Bhuvaneshwari, Upang Lalita, Maha Kali, Jagdamba, Narayani and Renuka are forms of Durga worshipped in Maharashtra and neighboring regions. Parrot Green – Goddess worshipped is Amba. Orange – Goddess Tara in some regions, Chamunda in other places.